Near Fine. Softcover in glossy pictorial wraps. First printing of first edition. Book is crisp, clean, and unread. Very light wear to front cover. Illustrated with black-and-white photos, a few color photos, plans, and elevations. 4to. 208 pp. including index. Heavy--will require additional postage if shipped priority or outside the U.S.
New. 0823002268. *** FREE UPGRADE to Courier/Priority Shipping Upon Request ***-*** IN STOCK AND IMMEDIATELY AVAILABLE FOR SHIPMENT-Flawless copy, brand new, pristine, never opened--208 pp., 213 ills. (100 in color); chrono., bibliog., glossary, 4to. --with a bonus offer. Very Good. 0823002268 Steele, James. 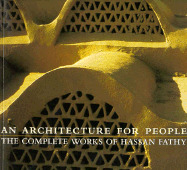 An Architecture for People: The Complete Works of Hassan Fathy. New York, NY: Whitney Library of Design, 1997. 208pp. Indexed. Illustrated. Bibliography. 4to. Paperback. Book condition: Very good. Light rubbing to extremities. Very Good. 4to-over 9¾"-12" tall. Very clean and sound. Unread copy. Color photo illustrations and line drawings throughout. 208 pp. Fathy, Hassan. Fine. 213 Illustrations, 100 in color. Square 4to, pictorial wrappers. New York: Whitney Library of Design, (1997). Fine.